CUSTOM GLASS MOSAICS MADE BY HAND IN NEW YORK CITY SHIPPED WORLDWIDE. Allison Eden Studios provides custom glass wall covering design and manufacturing services. Specializing in restaurant, casino, and luxury residential design- our unique style and the ability to establish the hottest trends is the result of participation in projects with leading architects worldwide. Manufacturing in New York City and working through a national dealer network, we are known for having the quickest turnaround time in the industry. With our finger on the pulse of this rapidly evolving market, we strive to provide our design partners with cutting edge, innovative, unique glass materials design. ModCraft produces sophisticated handmade modern wall tile using high-fire porcelain clay. Light plays across the tile’s glazes and modular surface patterns to create a dynamic visual effect. The result is elegant porcelain tile with a contemporary and modern feel. American made. As interest in our tile has continued to grow, we are now available in showrooms nationwide and directly depending on your location. Peter Brooks Stone Works specializes in custom design and creation of stone products like granite countertops,marble countertops , quartz countertops. As a stone manufacturer we offer precision quality in the fabrication and installation of natural stone and quartz slabs. We fabricate and install countertops, islands, vanities, bar tops, fireplaces, tables, tub surrounds, and more. Peter Brooks Stone Work serves the tri-state area and is conveniently located in Wood-Ridge, NJ. We work one-on-one with each customer, offering custom solutions including: edge choice, back splash options, and other personalized touches created from your hand selected choice of stone. You will receive expert attention to detail from our sales and fabrication professionals, operations and maintenance, Peter Brooks Stone Work is for you! For the past ten years, we have provided homeowners and commercial property owners with first class Bergen County tile installation and repair, specializing in the use of glass tile, as well as mosaics, marble, granite, ceramic, porcelain, slate and terra cotta. In addition, JMB Tile sells and installs glass shower doors. All of our New Jersey custom tile projects are geared toward bringing out the best in your home or property. We believe renovations shouldn't be made just for the sake of being made. The difference must be immediate. It should hit you the moment you enter the room. Your expectations will always be met, if not surpassed, by JMB! 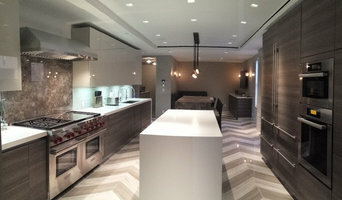 Expert Tile Inc. is a reputable and versatile stone, tile and mosaic installation business in operation since 2009. One of the things that sets us apart is our approach to every project – we are manic about attention to detail and timely delivery. Whether it’s your residence or office, we can help select materials and create technical solutions to give you the look you dream about. We are fully licensed and insured by carrying general liability and $10 million umbrella. Founder: Gregory Aivazian Gregory is a results-oriented, hands-on construction and development professional with 12 years of experience of all facets of high-end residential and commercial construction; with emphasis on technical and aesthetic aspects of fine stone, tile and mosaic installation of any scale. But he’s a craftsman at heart. Gregory started as a stone mason’s apprentice in Martha’s Vineyard at the age of 19, falling in love with the beauty of natural stone. Soon after, he learned the craftsmanship of tile and mosaic installation and design from a well known Italian sculptor and mosaic artist in New York. Over the years he's worked on multiple high end residential and commercial dwellings in Manhattan, both managing multi-million dollar projects and coming up with various technical solutions as needed. Gregory started Expert Tile in 2009 to take on his own projects. Artistic Marble & Granite Surfaces is a premier supplier & fabricator of kitchen counter tops, bathroom vanity tops, jacuzzi and fireplace surrounds, as well as other products for residential and commercial applications. Our staff of experienced experts provide material, fabrication, template measuring & installation services. Mondial Tiles is a family-owned-and-operated tile store in Brooklyn, New York. Established in 1974, we have one of the largest showrooms in New York, and have furnished countless residential and commercial projects. We were even chosen by This Old House as their supplier and fabricator for a project they did in New York City! Let us provide you with tile or stone products for flooring, countertops, fireplaces, and many other applications. More than 95% of our showroom products are always in stock and offered at competitive prices to fit within your budget. Whenever you need some guidance, our friendly and knowledgeable associates offer hands-on assistance with design and selection for your individual project. MyStyleTile is a family owned company. Although our business is registered in 2014 the owner has more then 25 years experience in tile installation. 18 of them in New York City. 7 years he was working in Local 7 for the leading company 'Port Morris Tile and Marble Inc.' as a tile setter and foreman, gaining unique experience from its managers and mechanics. MyStyleTile was founded to serve its customers by offering extremely high quality in tile installation, using the right materials, and following strictly the technology of the trade. Our team works professionally, fast, clean, meeting deadlines, and without punch-list. We are trained to consult on time with anyone involved in the project and consider every useful opinion. Welcome to the world of Express Cabinet And Bath! We are a family owned and operated business dedicated to carrying the best products for every area of your home at unbeatable prices. When you enter our showroom you will be dazzled by the sheer variety and level of quality of our workmanship and delight in your instant eligibility for exceptional prizes to grace your home. We are proud to bring you the finest tile and stones from around the world at prices you’ll just have to see to believe. At Express Tile, customer service is our highest priority and with thousands of stocked tile, marble, natural stone and other products that are available for immediate pick-up or delivery, we will meet or exceed the product quality of any competitor. Our history in the area runs deep, ours was the first factory direct tile importer and the distributor that offered 99 cent tile in the tri-state area. From that time on we have always strived to honor customer requests and, in turn, our customers have shown a loyalty we deeply appreciate. We are a direct tile importer from Turkey, Italy, Spain, India and China offering an extraordinary product selection including: marble, tile, ceramic, porcelain, quartz, travertine, slate, natural stone, hardwood floor glass tile, kitchen cabinets, counter-tops, bathroom vanities, faucets, shower doors, grout, thin set, glue and all tools for installation. Words can only set the stage for the full beauty of these glistening stones. High grade stone is not only our specialty, we also feature a large selection of kitchen cabinets, bathroom vanities, accessories, and building supplies. No matter the style, our collection is designed to appeal to every taste. Come and design your dream room, whether classical, traditional, modern or contemporary, we have it. Our experienced kitchen designers can guide you through the process: providing estimates, offering solutions to design problems, and recommending tile installers and contractors in addition to product delivery and installation. We work with professional trained interior designers to guarantee that we bring your vision to life. At Express Tile we can help you transform your home into what you’ve always dreamed it could be. To find out more, stop by and talk with our designers, stone specialists, and all the professionals at your service. We look forward to meeting you! Wild English Stoneworks is a family owned and operated stone fabrication facility with over 30 years experience located in Brooklyn N.Y. We use state of the art templating and fabrication equipment and our expert craftsman have the abilities to create anything that a machine cannot. From template to install and everything in between we guarantee nothing but precision. Our knowledge of stone along with our craftsmanship is what sets us apart from the rest. Wild English has completed some of the most high end commercial and residential projects in the NY area with more being completed every day. Give us a call to see how we can help turn your dreams into reality.